Images from Paul Ryan Tan/Sports5. The season’s second conference is reaching its home stretch, and the time is ripe for us to look back and show our appreciation for the players who really stepped up and made their mark. 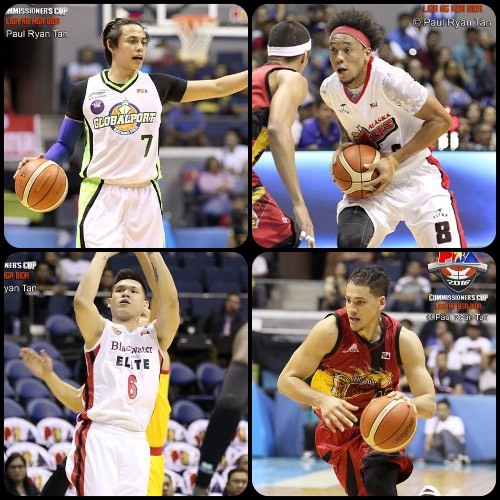 The PBA is a talent-rich league, and this can be easily seen in the number of productive wingmen from all over. I mean, look at the list that’ll follow. It’s a combo of established veterans and up-and-coming young guns. And legends James Yap and Mark Caguioa aren’t even part of it! - The 35-year-old scored in double-figures in all but 3 games this conference, including averaging 21.5 per game in the quarterfinals against SMB. He can still flip the switch and score at will, impending retirement notwithstanding. - Newsome has been a huge reason Meralco has gone so far this conference. He has been effective as a big guard, a swingman, or a small-ball PF for the Bolts, adding a lot of versatility to the club. He bombed in Meralco’s loss in game 3, but he should bounce back strong and help the Bolts moving forward. - The super sophomore struggled against Ginebra in the quarters, but he was stellar against the Beermen in the semis. He’s so good he can play either guard position for the Painters, and he’s one reason Jeff Chan has had to play a lot of small forward this season. - KG showed strong play early this conference, helping the Enforcers win three of their first four games, but his play plateaued and eventually dipped as the games went by. He’s the barometer of this club, and if he can regain his effectiveness, they should make some noise in the Govs’ Cup. - Lassiter scored in double-figures in the team’s first 13 games of the conference, but he totally bombed in the first two outings of the semis, dropping a total of just 6 points in that span. Still, he remains one of the most versatile and dangerous wingmen in the league, and I, for one, would love for him to return to play for the national team this year. - One can argue that Maliksi was the main beneficiary of James Yap’s extended absence this conference. The 6’3 swingman can single-handedly shoot the Hotshots back into a game or, conversely, out of it. That basically underscores his ever increasing importance for that club’s scheme of things. - In nine of his eleven games this conference, Lastimosa scored 16 or more points, including five where he registered 24 or more markers. He’s a poor man’s Terrence Romeo, though, I’m not sure he can duplicate that kind of production if he plays for any other team. Im mean, he plays around 36 minutes per game for the Elite. - Anthony has been dislodged as the top small forward of the PBA, but he remains a strong and very productive player for the Road Warriors. He norms a near double-double, has extended his range, and can just kill the defense in so many ways. - The Beast is back and feasting again. It seems he’s getting better and better as each game goes by, and that is a very good sign for Alaska as they try to return to the Finals. If the Aces do successfully make it past Meralco, Abueva will be expected to give the Elasto-Painters a ton of headaches. - Romeo missed a couple of games this conference, but when he was playing he was still a sight to behold. I mean, he scored double-figures in every game this conference, topping things off at 41 against Mahindra and his conference-low was 17 against Blackwater. I definitely cannot wait to see him in a Gilas kit again playing like a whirling dervish in the #FIBAOQT!